During my stay in Skopje (Скопје) , I visited also Lake Ohrid, Lake Prespa, Ohrid, Struga and some other minor cities in the south-west of the country, and now I’m going to quickly comment a little bit about them. 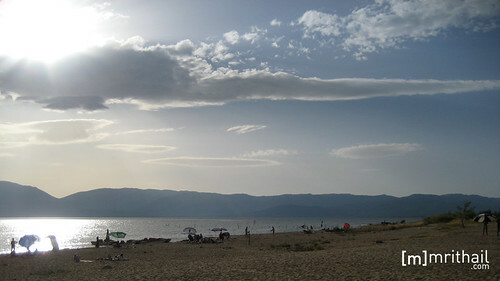 Lake Ohrid (Охридско Езеро) is part of the border between Macedonia (Македонија) and Albania. Aside from being the deepest lake in the Balkans, it’s supposed to be the oldest lake in Europe. It’s surface is 693 m. over the sea level, and has an area of 385 km². I really love this lake. Its fresh water is crystal clear and the blue reflection of the sky, simply amazing. It’s an incredible sight that you must live both with your eyes and your skin. 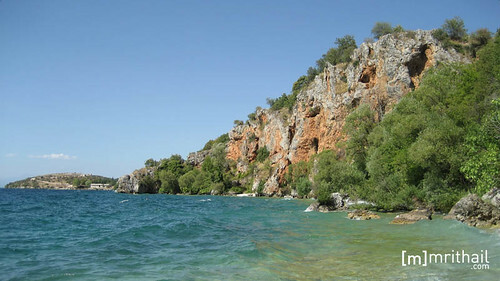 The only drawbacks were that most of the beaches of this lake were rock beaches, and in most places were too crowded. The city of Ohrid (Охрид) is, of course, situated on the shore of the lake. It has a population of a little bit less than 50,000 inhabitants. It’s part of the Cultural Heritage of the UNESCO, both for the city itself and because of the lake. Also, it’s the birthplace of the Cyrillic alphabet, created by St. Clement of Ohrid by reforming the Glagolic alphabet, which was invented by the brothers Saints Cyril and Methodius. 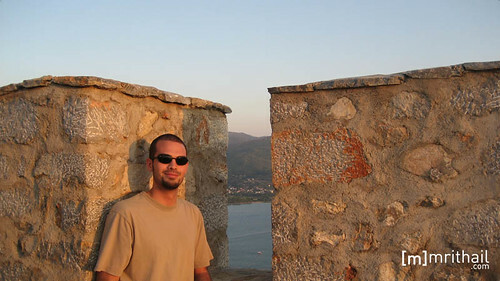 Ohrid is a small and beautiful city full of low buildings and churches. Its architecture is very particular, with buildings that get broader as they grow high, to take advantage of the available space. 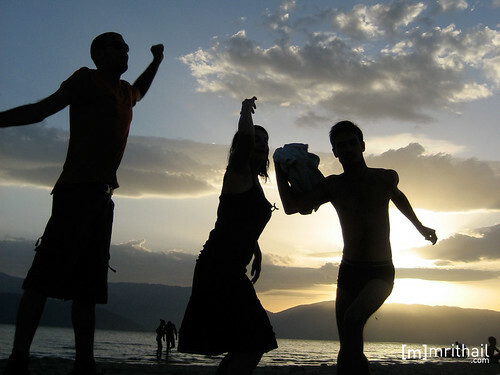 During the weekends, Ohrid is usually overcrowded, as it’s one of the main destinations of Macedonia for having holidays or just a weekend break. In this city I found specially interesting Samuil’s Fortress (Самуилова тврдина), which presides the surroundings from the top of of the hill. The Church of St. John at Kaneo (Црква Св. 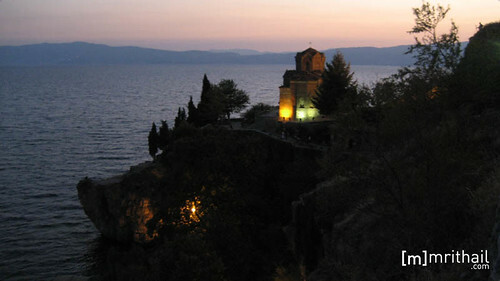 Јован Канео) offers a great view of Ohrid and is really beautiful and comfortable at night. St. Naum Monastery (Манастир Св. Наум) is 30 Km away from the city, but it’s also one of the main sights of the area. 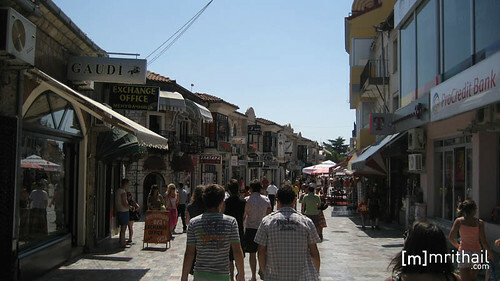 Also in the shore of Lake Ohrid you can find Struga (Струга) , a city with a population of about 35,000 inhabitants. 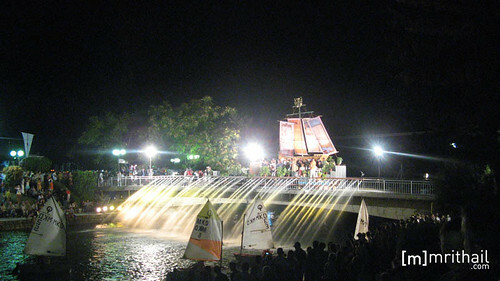 One of the most relevant things about it is that it’s the seat of one of the most (if not the most) biggest poetry events of the world, called Struga Poetry Nights. Struga is a little bit smaller than Ohrid, but it’s also much less crowded during weekends and holidays, and that is something that echoes in the lifestyle of the city, which is much more relaxing. Aside from the sightseeing, a nice experience here is to have a typical Macedonian dinner in one of the restaurants at the bank of the river. On the other side of one of the mountains surrounding Lake Ohrid, we can find Lake Prespa (Преспанско Езеро) which is divided into two different lakes, being one The Great Prespa Lake, not only shared by Macedonia and Albania, but also Greece; and the other The Small Prespa Lake, present only in Greece and Macedonia. In this case, the surface of the lake is at an altitude of 853 m. and has a surface area of 190 km². We can say that Lake Prespa is to Lake Ohrid what Struga is to Ohrid. It’s smaller and quieter… definitely a completely different style. But one of its biggest advantages is, of course, its sand beaches! Much more comfortable than the rock ones, hehe. Also, the view of the islands of the lake, especially the biggest one, which is know by the two different names of Large Town (Голем Град) and Snake Island (Змиски Остров); is really nice from the shore. I hope one day I’ll have free time to do such things as traveling. I randomly found this sight while reaseching for a assignment on a selected city (ohrid was my chice)just wanted to say, very good choice with your holiday destination and love what you have dun, info is exelent and the photse dont get any better.